Can Sea Otters Make a Comeback in the San Francisco Bay? A sea otter swims in Monterey Bay, California. Imagine sea otters drifting and diving in San Francisco Bay and swimming in the abundant pickleweed of the salt marshes surrounding its waters. Up until the early-1800s, that would have been a common sight. They’ve been long gone in our area, since the 1840s when fur hunters trapped the last of the surviving bay population around Corte Madera Creek. A remnant population, discovered near Big Sur in 1938, has been slowly expanding from an estimated 50 otters. 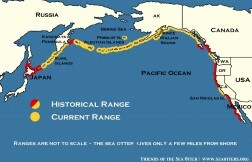 Southern sea otter populations span from east of northern Santa Barbara to around Pigeon Point, and includes a small population on San Nicolas -- the westernmost of the Channel Islands. The annual Southern sea otter population count, just released, showed a complex but hopeful trend. The population appears to be increasing slightly overall, but it still hovers below the level needed to delist the federally threatened species. The southernmost population appears to have the highest mortality from great white shark bites. They’re not eating them, just tasting, but the otters can’t survive a bite. The largest population, in Elkhorn Slough on Monterey Bay, is the object of a new study by UC Santa Cruz professor Tim Tinker of the U.S. Geological Survey (USGS) and a team of scientists from a collaboration of agencies and non-profit organizations. Dr. Tinker commented, "Otters are an important species to study. They’re an apex predator and have a direct bearing on the health of the ecosystem." The preliminary data from the Elkhorn Slough otter study reveals some interesting information. Tinker stated, "In the the slough, otters' primary foods are crabs, clams and worms, as well as snails and other benthic species. The data so far noted that areas in the slough populated by otters had healthier seagrass beds. Since with fewer crabs, the isopods and sea slugs could graze the algae off the grass, promoting better seagrass growth." I wondered about otter behavior in the slough compared to kelp beds. He said instead of anchoring themselves and their pups to the kelp, otters in the slough use pickleweed or float in secluded, sheltered channels of the marsh. "Sea otters," he added, "also act as an indicator species, a watery “canary in a coalmine” for environmental toxins that might affect human health. We eat many of the same sea creatures as otters, so toxins in their food may also be present in ours." Watch this video about an environmental contaminant that was killing sea otters that started at Pinto Lake in Monterey. Veterinarians from the Monterey Bay Aquarium and the California Department of Fish and Wildlife examine a sedated wild sea otter, performing important health checkups and taking biopsies to study on this threatened species. The Elkhorn Slough study will track individual otters over the next couple of years to gain a more complete and deeper understanding of the estuarine population. Scientists use dip nets to capture sea otters along with other methods. Here's a video of the scientists capturing an otter at Elkhorn Slough on Sept. 19, 2013 (courtesy of CA Department of Fish & Wildlife). Perhaps this will ultimately help scientists understand and better inform resource managers about how to bring the sea otters back to their historic range, which might eventually mean we could enjoy them again in our own estuary: the San Francisco Bay. 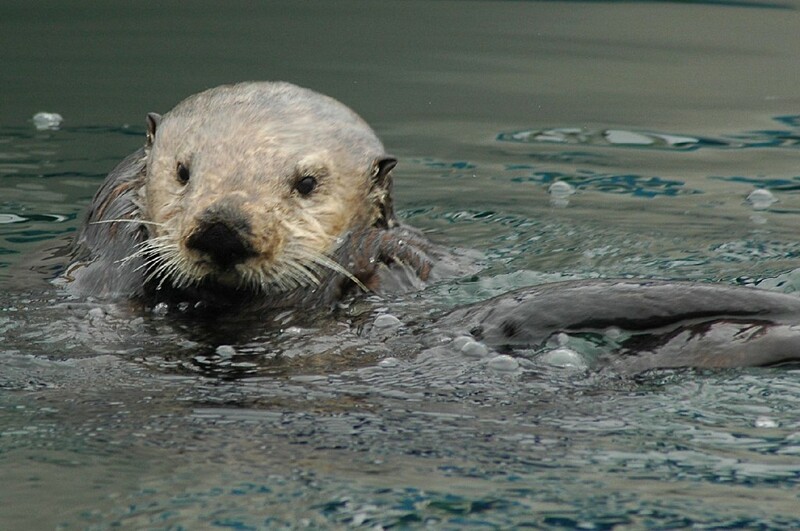 You can learn more about how you can help sea otters at the Friends of the Sea Otters website. Test your otter counting skills on the USGS website for educators with the “Otter Spotter” game. You can also enjoy the newly launched otter camera (during daytime hours) and observe otters at rest and play in Elkhorn Slough. Many of them are females and pups. Mostly, though, you can help sea otters by appreciating and protecting the amazing natural environments and land-sea interfaces we share.